China has a brand-new jet fighter. Only it’s not really brand-new at all. The emergence of the much-touted Shenyang J-16, following years of speculation, represents a surprising twist in China’s more than decade-long effort to build a world-class air force — and a reminder to outsiders that even Beijing with its tight central control, extensive manufacturing base and apparent deep pockets cannot perform aerospace miracles. In December 2010 the Chinese People’s Liberation Army Air Force shocked observers when it allowed civilian photographers to snap and publish photos of China’s very first, and previously unseen, stealth fighter prototype undergoing ground testing in Chengdu in central China. The J-20 “Mighty Dragon” took off for its apparent first test flight on Jan. 11, inaugurating what some have described as a new era of aerial warfare, in which advanced Chinese aircraft might challenge the decades-long dominance of the U.S. military with its stealth fighters and bombers. “China’s new Chengdu J-20 stealth fighter was an important milestone in China’s Long March toward parity in military technology with Russia and the West,” wrote Carlo Kopp, an analyst with Air Power Australia, an independent think tank. Not only did China possess the J-20, its aviation companies were also said to be hard at work on several other radar-evading fighters similar in philosophy to the American F-117, F-22 and F-35 fighters and B-2 bomber. Among these rumored warplanes was the J-16, reportedly in development in Shenyang in northeastern China. The J-16 was, if anything, scarier to the American defense establishment than the J-20, for it was more practical. The Mighty Dragon was clearly an experimental aircraft incorporating design elements typically not seen on Chinese warplanes, including internal weapons bays. Moreover, the twin-engine J-20 apparently lacked purpose-built engines and could be seen flying with Russian-made AL-31F engines likely poorly-suited for the airframe. A year after its debut the first J-20 had completed only 60 confirmed testing flights of the thousands required by a new warplane design. A second copy of the Mighty Dragon appeared in the spring of 2012 but by summer still hadn’t flown. The J-16, by contrast, was rumored to be a heavily upgraded version of China’s existing J-11 and J-15 fighters, themselves both reverse-engineered models of Russia’s twin-engine T-10 “Flanker,” which has its roots in the late 1970s but has since evolved into a highly-effective heavyweight interceptor and ground-attack plane. The AL-31 engine was designed specifically for the Flanker. Russian T-10 derivatives still use the AL-31, as do most J-11s and J-15s. In essence, the J-16 was thought to be equivalent to the Russian T-50, an adaptation of the T-10 with the same basic engines but a new airframe optimized for its low radar signature — though not as low a signature as the U.S. F-22. “It’s not an F-22 in many important ways,” Bill Sweetman, a a highly regarded aviation journalist, wrote about the T-50. The new Russian fighter first flew in January 2010. Today there are three T-50s undergoing testing towards a possible full production version of the jet sometime in the 2020s. Inasmuch as the Chinese J-16 represented a parallel development to the Russian T-50, it promised to provide Beijing a more harmonious new fighter — and much sooner — than would be possible with the J-20. The Mighty Dragon is likely a decade away from frontline service, if it’s even meant to serve in that capacity. The evolutionary (as opposed to revolutionary) J-16 could be ready for combat in just a few years — and still offer big improvements over older jets and better prospects against American-made warplanes. “It’s the race of the stealth fighters,” commented Larkins Dsouza, an analyst with Defence Aviation in his write-up on the J-16. 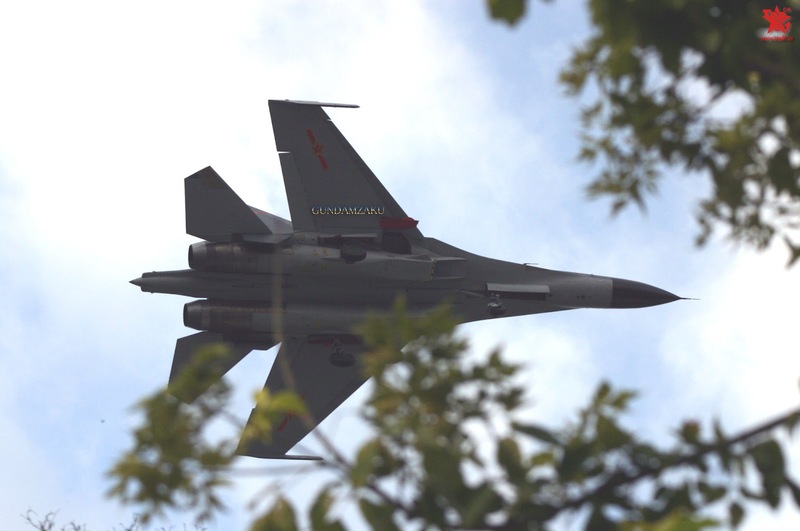 The J-16’s first public appearance occurred in Shenyang in April, when the PLAAF flew at least one of the new fighters before a press audience. Hong Kong’s Kanwa magazine described the J-16 as a direct copy of the Su-30, a version of the T-10 dating from the late 1990s. The J-16 in fact does not feature any of the rumored stealth enhancements, such as can be found on the T-50. Apparently, the only difference between the Chinese J-16 and the Russian Su-30 it’s copied from is that the J-16 can carry Chinese-made weapons. Both the J-16 and the Su-30 use the standard, Russian-made AL-31 engine. In that sense, the “new” Chinese fighter isn’t new at all. Instead of representing an immediate step towards a stealthy fighter force rivaling America’s, Beijing’s new warplane holds the line at late ’90s-early 2000s technology. Unless China is developing any other new warplanes — and that’s certainly possible — a true generational leap in front-line fighter technology will have to wait for the J-20 to achieve operational readiness. That could take a decade, by which time the U.S. military will likely have brought potentially hundreds of new F-35 stealth fighters into service. As the J-16 was making its first public appearance, Beijing was also negotiating with Russia to purchase copies of the Su-35, the newest T-10 model. The proposed purchase only underscores China’s apparent inability to produce its own combat-capable versions of even moderately stealthy warplanes anytime soon. Perhaps Beijing is learning the lesson that the U.S. government learned during the 15-year, $70-billion development of the F-22: that inventing stealth fighters is hard. I think Axe’s logic is flawed if he thinks following the way the US develops new fighters is an accurate guideline. I don’t think the J-10 had 10 prototypes in the beginning yet it’s fully in production. Neither the FC-1/JF-17.